We clean and passiviate parts and components for almost every cleanliness-critical industries and applications. Our extensive library of specifications and procedures enables us to meet any customer or end user requirements. We are well suited for processing hardware and components related to space, aircraft, military & defense, semi conductor and other industries requiring these precision services. This Cleaning process removes contaminants that affect the passive layer. For Stainless Steel surfaces, an optimal passive layer provides corrosion resistance. A passive layer surface will inhibit oxidation, thus minimizing particulate contamination. Astro Pak only uses approved chemistries and cleaning processes to provide certification to meet customer specifications. Cleanliness specifications are also used in a variety of other liquid and gaseous environments, including nitrogen & hydrogen storage and distribution systems. Our CA facility is the largest if its kind, boasting state of the art ISO 9001:2008/AS9100 Certified Class 5 (class 100) and Class 6 (Class 1000) cleanrooms that are controlled and monitored. All hardware and components that enter our cleanroom include real time electronic tracking to keep customers better informed on the status of order. In addition to Cleaning and Packaging, we also allow customers to come onsite and assemble their own parts after cleaning. We also offer Precision and Oxygen cleaning services in our newly acquired location in Florida. We also offer a fleet of mobile cleanrooms, equipment and chemicals to your site. In addition to cleaning, we also provide assembly and packaging services. We also perform testing services including RGA and Vacuum Bakeout, Helium Leak Testing and Hydrostatic & Pneumatic Testing. We test gauges, valves, tubing assemblies, and other components, as well as in-place systems, vessels and equipment. 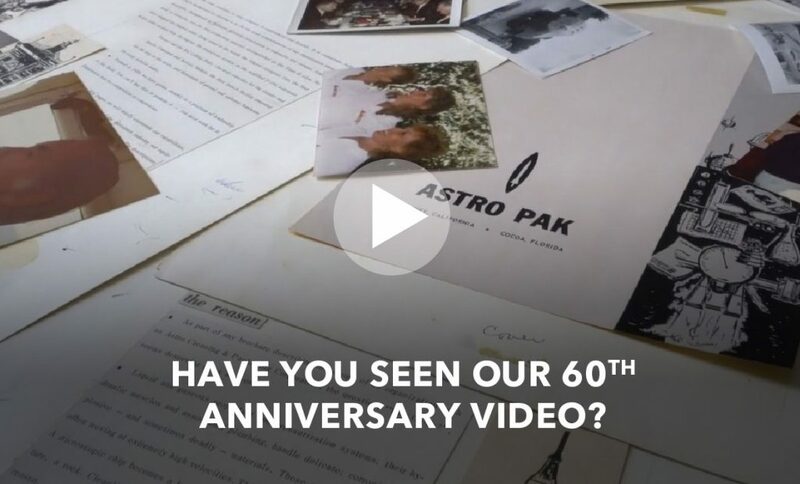 For nearly 60 years, Astro Pak has been perfecting the chemistry and cleaning process of Passivation and Precision Cleaning. Our wealth of experience and understanding of stainless steel surface chemistry led us to develop our proprietary passivation chemistry and process for stainless steel that produces an optimized passive layer on the surface of stainless steels. We package items ranging in size from small fasteners or washers, to huge 70 ton vessels and satellites. Our packaging services also meet the requirements of literally hundreds of industry specifications. This includes aerospace contractors, ULA, NASA, the Department of Defense, and many private industries and organizations. In addition, our Certification packages are QMS/cGMP compliant for your systems and equipment maintenance records. Let our experienced and credentialed team of chemists, engineers, and other professionals on staff EXCEED your expectations. Astro Pak provides onsite training and education through our Lunch & Learn programs. We present the latest research on Passivation and Derouging technology, stainless steel surface chemistry, Precision Cleaning, Electropolishing & Mechanical Polishing, and Passivation. We also provide lunch for your facility! To learn about our Lunch & Learn program please contact us!